This area is comprised of massive phreatic arkose breccias on the western perimeter of the collapse caldera. 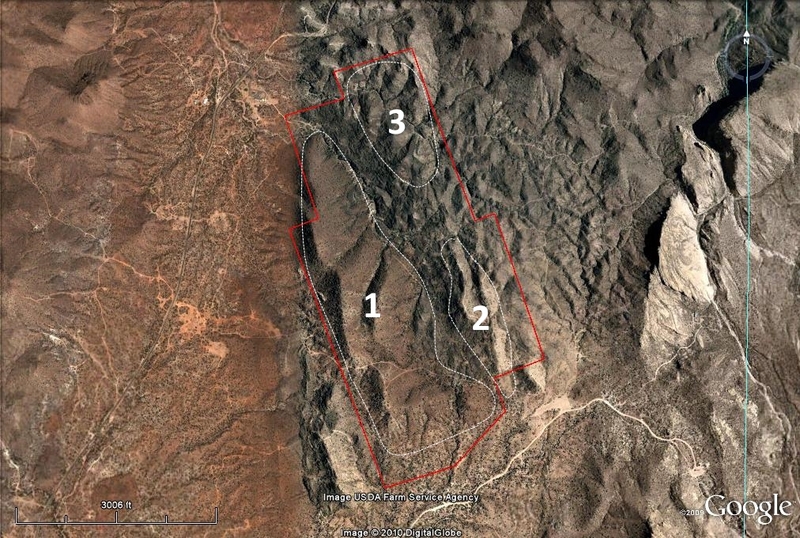 The breccias are what was the Whitetail formation that is approximately 500 feet thick. The alteration here is textbook, grading from epidote on the perimeter, to sericite, chlorite and silication of the marble cobbles in the center of the area. The zones overlap, and silicification overprints all of them. The area is a VMS deposit that was mined previously as described in the “Great Mine” page. The deposit formed alongside the Rhyolite neck of the strata volcano. There is a great amount of gossan breccias found on the hill in the center of the area dubbed “Cerro Negra” . Silicification, calcification and advanced argillic alteration are found in the area, with silicification and advanced argillic argillation being found in distinct halos surrounding “Cerro Negra”. This area has a maar diatreme near its center. The geology here is more complicated due to multiple explosive events, and there is intense calcification, silication, and types of gossans not seen in the other 2 areas. However, the area is mostly overlain by basalt like area 2. 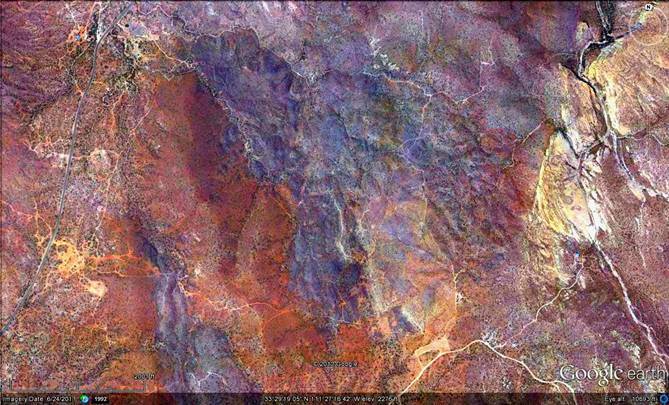 The discovery that the Molly Marie Prospect was located on a collapse caldera occurred after enhancing a Google Earth photo. The iron stained “halo” over one mile in diameter can be seen below, with the west side breccias having the most clay alteration. 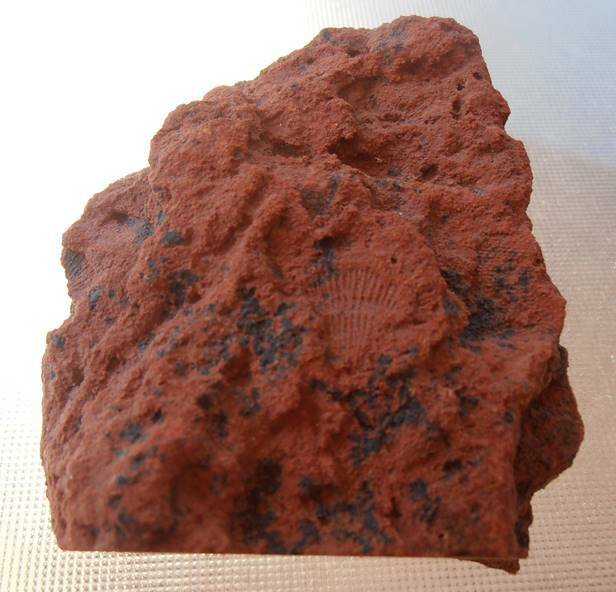 The iron gives the red coloration to the great amount of clay overlying much of Area 1 and especially the east sides of the ridges. It is hypothesized that the clay originated from acid destruction and the boiling zone beneath the ridges; this is where arkose was destroyed by the boiling water and vented and deposited on the inland seafloor. Typically, the float and outcrops of breccia in the clay-covered areas are laced with drusy quartz, further evidence of extensive boiling that occurred below. On the right side of the photo, remnants of the slope of the strato-volcano can be seen. The volcano’s neck is on the south side of the caldera and is located just north of the First Water trailer parking lot; it is a pink color in the photo. The brine lake was located on the western side of the collapse caldera, and on the western side is where most of the brecciation occurred. This was the “wet side” and and is also where the likely bulk of the ore formation took place. 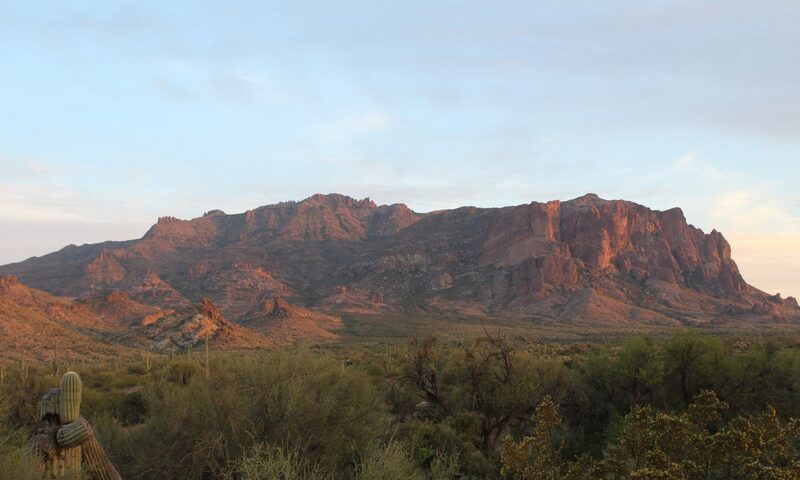 Typically, the alteration zones are more exposed on the west side of Area 1 because of less red clay cover, and because the epidote zone is largely covered by basalt on the east side of the ridges. 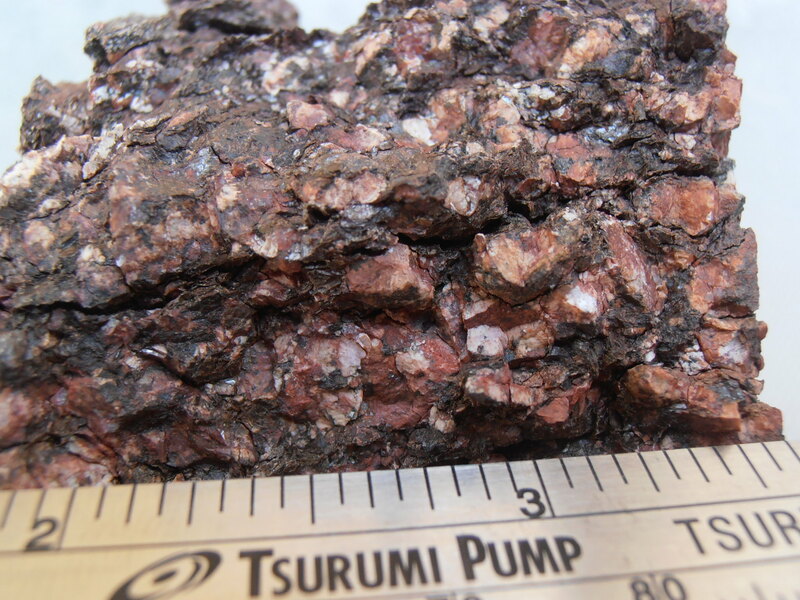 The epidote alteration on the claim group on western and southern sides of ridges of Area 1 is intense and widespread, and indicates just how large this hydrothermal system is. The photos below are un-enhanced. Below is another outcrop of the Sericite Phyllite. 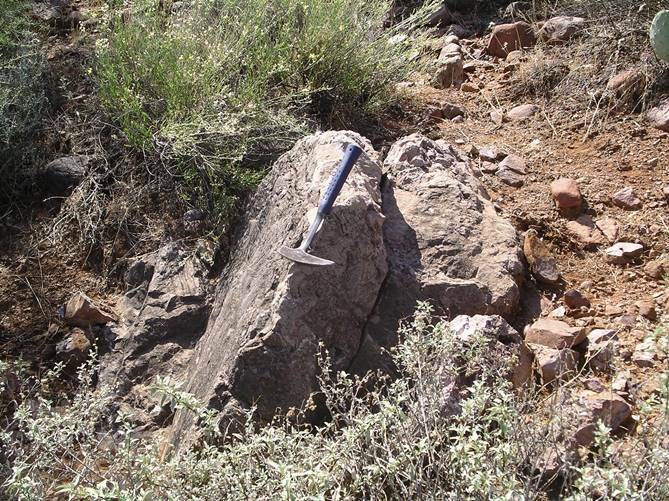 Along most of the the eastern side of the ridges in Area 1 there is a an intense outcropping phyllic alteration zone, although there is less Sericite as the western side. It is believed that this zone continues beneath all of the arkose breccia ridges. There are large zones of phyllite alteration that are expressed by flakes of sericite and quartz in the clay/cobble cover. 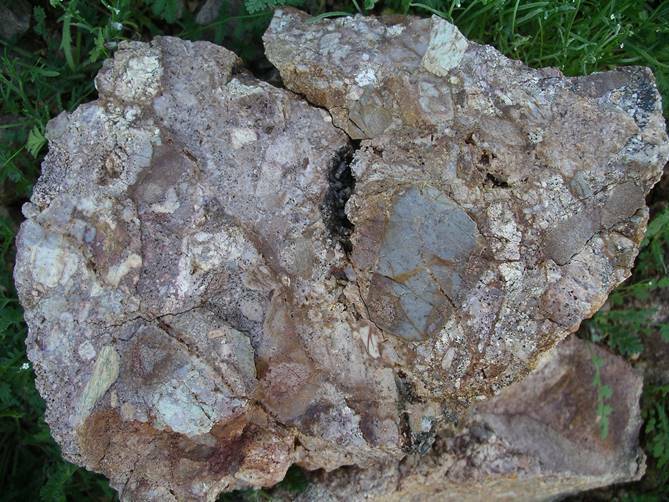 This Phyllic alteration is reported in several of the Mexican VMS deposits. Below is a closeup photo of the intense phyllic alteration on the east side of Area 1. It is suspected that there is a VMS beneath this zone at a shallow depth. Of all the alteration types found on the Prospect, Black Chlorite alteration is one of the most important because this alteration is exclusive to VMS deposits. 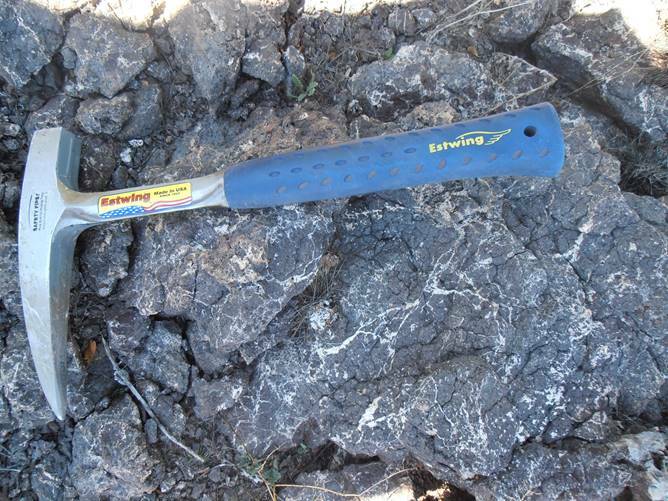 Black Chlorite alteration replaces feldspar, and occurs in abundance in Area 1; the black chlorite can be seen on the walls of the washes of exposed breccia rock. The areas where the seismic surveys have been done align well with Black Chlorite outcrops on their perimeters, and the Black Chlorite indicates where many more untested potential pits are located. 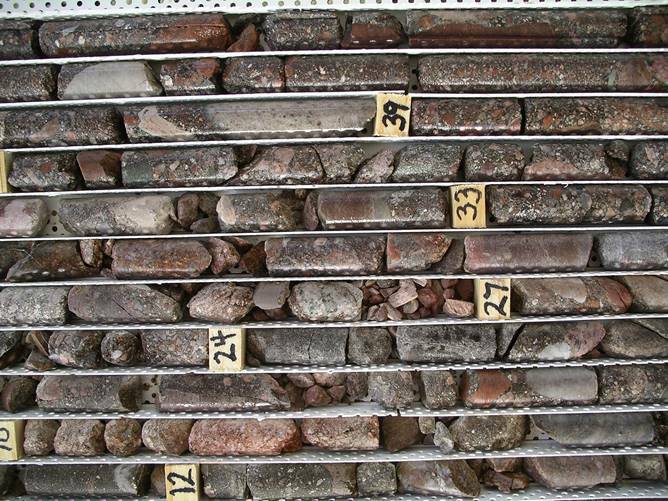 Four 50-foot core holes were drilled in the breccias, and extensive black chlorite alteration of the feldspar was prevalent in two of them. Below is a close-up of green chlorite alteration found extensively in some brecciated areas; the boulders and cobbles of granite are more susceptible to alteration. The green chlorite and greenstone are found in a very wide zone as a halo in Area 1, and it has been found the black chlorite is generally found where the VMS vents (pits) were located. The arkose breccias in Area 1 are very susceptible to green chlorite alteration as shown below. Although not shown, Some basalt is also heavily chloritized. There has been much recent erosion due to heavy rains after an extended drought, and some of the choritized arkose has been exposed as in the photo below. The chlorite zone in the brecciated Whitetail formation of Area 1 has an abundance of limestone cobbles and boulders that have been metamorphosed into Marble. 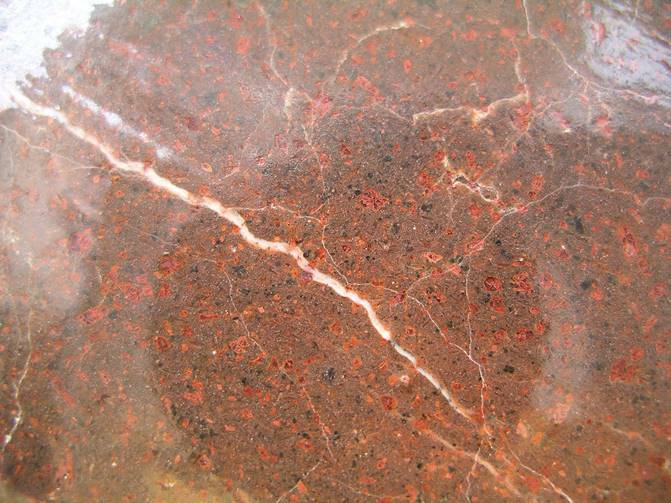 Below is a photo of a cobble from at first appearance is a limestone cobble, but one hit with a hammer reveals that it is red marble. Note the conchoidal flake of marble on the right. 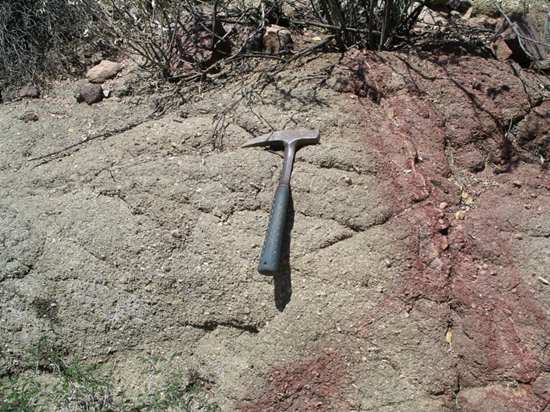 A filled-in pit proven by seismic methods is nearby the boulder of pink marble shown below. . On the breccia ridges, most of the limestone cobbles have been altered to red, gray, or banded marble, ringing like glass when struck with a hammer. Although not normally as dense as shown below, the brecciated Whitetail formation has an abundance of limestone and marble cobbles. The area in the photograph below has no limestone cobbles, as they have been replaced by silica, either by jasperoid, saccharoidal silica, or sponge silica. There is likely a boiling zone beneath this area. 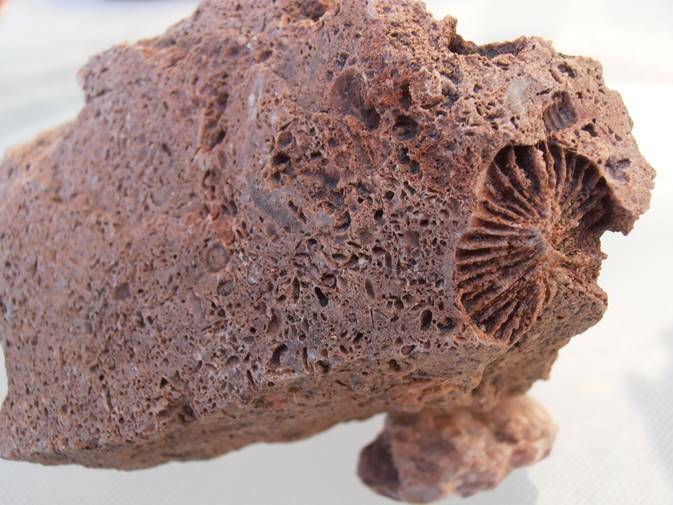 Below is a piece of fossilized limestone that has been replaced by silica, creating a “sponge” texture. 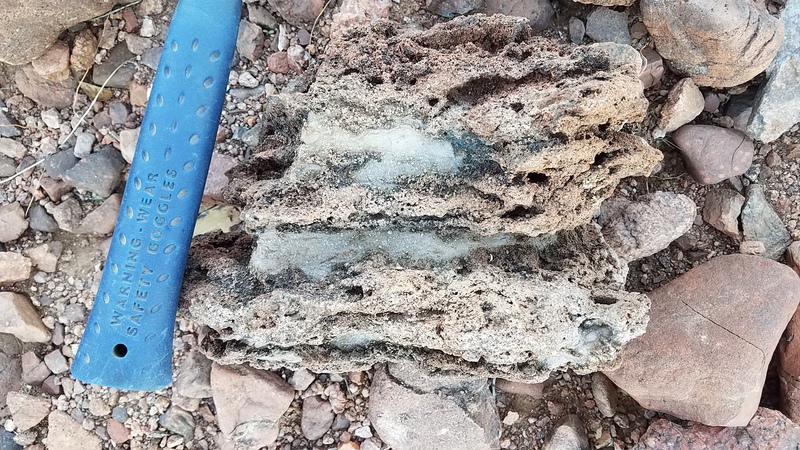 The below fossilized barnacle and microbial mat (right side) were encased in saccharoidal silica in shallow water at the same time as the ore was being formed? 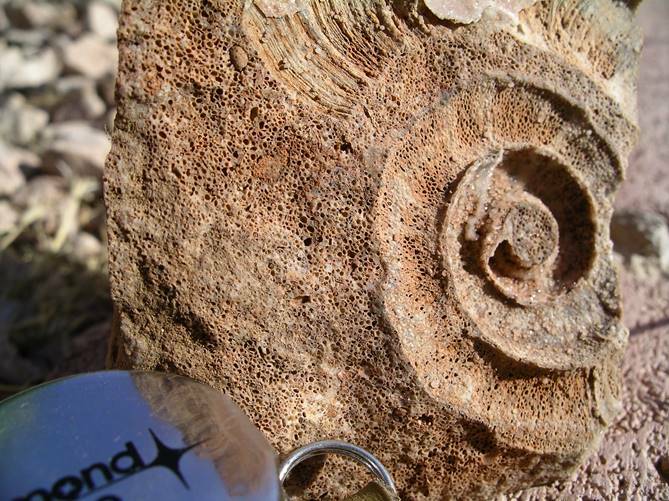 Or, did silica replace limestone that contained the fossils? The picture below is of a typical pebble of limestone that has been replaced by silica. A buoyancy test was performed on this rock, and it nearly floats. After zooming in, it can be seen just how porous this pebble is. Intense silicification is present in all of the alteration zones, both in the brecciated ridges and in the basalt. 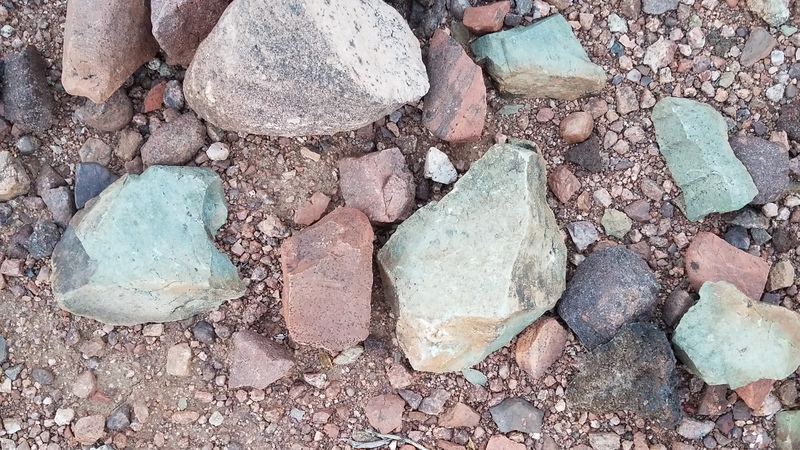 On the edge of the maar in Area 3 there is a large zone of basalt that has been replaced by glassy jasper. This glassy basalt is also nearby the milled breccia described in the Calcification section below. The gossan breccias that are the vent of the VMS beneath the hill dubbed “Cerro Negra” in Area 2 are surrounded by basalt, and they are surrounded by a zone of silicification as shown in the photo below. 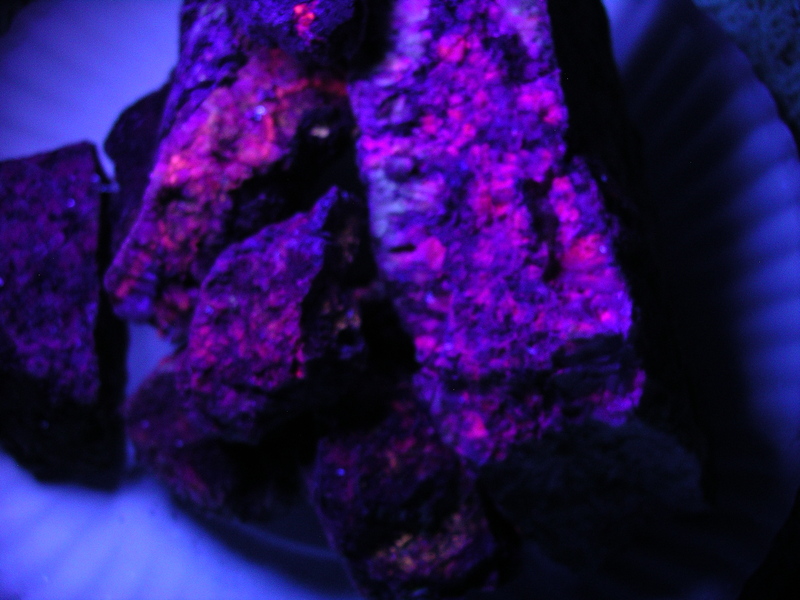 Some of this material is highly florescent under UV light (red). 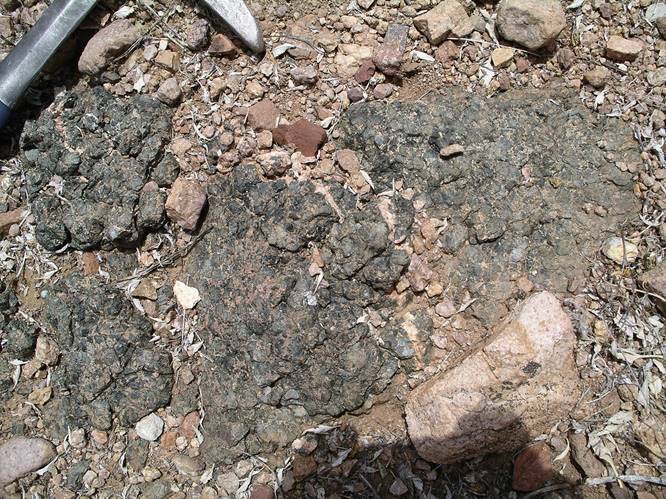 In some areas of Area 2, the basalt has been nearly completely replaced by silica through the process of metasomatism, and in others the augite has been replaced by epidote. It is speculated that the Whitetail formation below the basalt in these areas has been replaced by massive vuggy silica. Below is a photo of a sawn piece of another type of silicified basalt. The veinlet of quartz is about 1/2 mm wide. What appear to be voids are augite replaced with hematite and clear quartz. Silicification and drusy quartz is found throughout all alteration zones in the brecciated arkose. 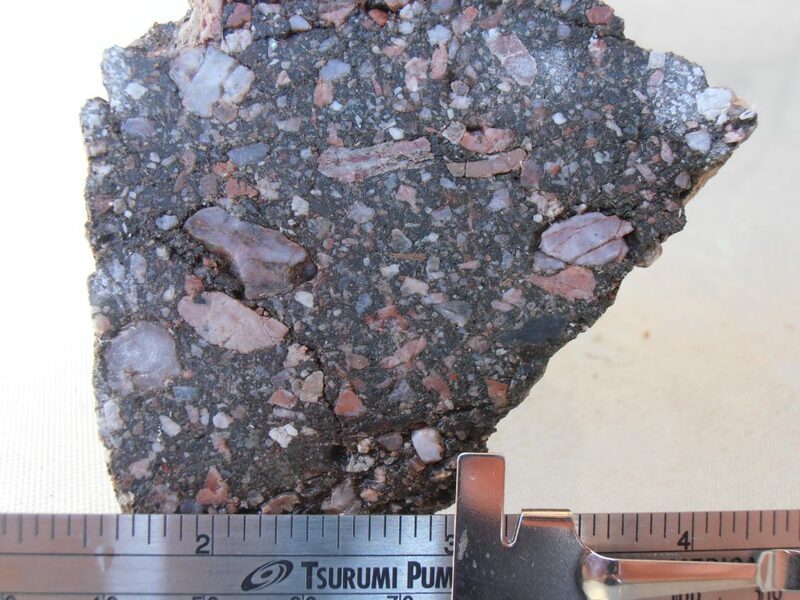 Below is a piece of arkose breccia that is common in outcrops in Area 1, and quartz crystals lining the voids can be seen. Under magnification, the full extent of drusy quartz is visible. Some brecciated arkose areas have been completely replaced by silica and only faint outlines of the clasts remain. Some areas in the basalt between Areas 1 and 3 are saturated with banded quartz veinlets. 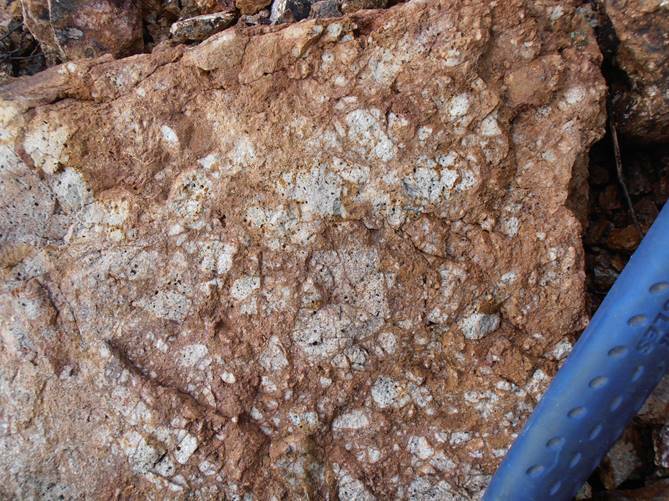 It is believed that these veinlets are closely associated with a high sulfidation gold deposit below. These are similar to those described at the high-sulfidation gold district of Maricunga, Puru. 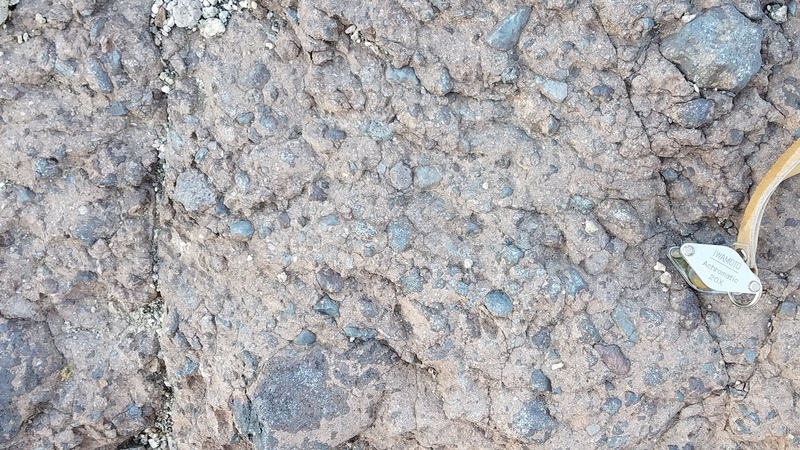 On the ridges in Area 1 can be found patches of amphibolite fragments that are often 100% hornblende. 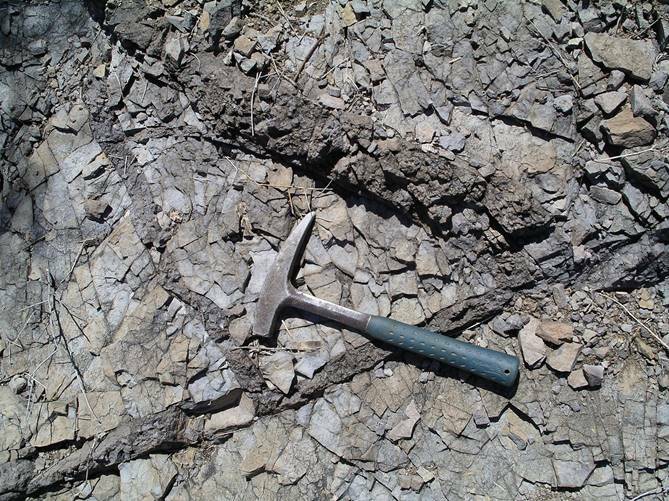 During ore formation, the basalt that overlaid the Whitetail arkose was fragmented by brecciation, but could have been buried under as much as 2000 feet of volcanic debris. The basalt above the boiling zones was transformed to Amphibolite. Below are some of the larger pieces found. In Area 3, areas of basalt that are underlain by rhyolite are “cooked” to a laminated rock that is a nondescript brown color. 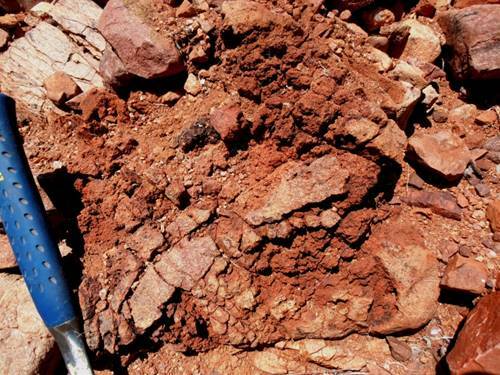 In the photo below, this flaky rock can be seen, with dikelets of intrusive rhyolite breccia. As written in the Ore Genesis page, it is theorized that massive Vuggy Silica was created above the magma chamber during the “dry phase”. On the southern perimeter of the collapse caldera in Area are found breccias consisting of mostly Vuggy Silica. This piece below came from a shallow prospect pit on the southern edge of Area 1. The massive gossan breccia outcrops at the hill dubbed “Cerro Negra” appear to indicate that there was 100% replacement of the Whitetail formation beneath the basalt. Whether this is due to the high amounts of limestone and marble in the Whitetail or the intensity of the boiling is not known; maybe due to both. There are at least 2 separate VMS deposits in Areas 2 and 3 that have large outcrops of milled gossan breccia, some of it containing noticeable Aurichalcite when a fresh face is magnified. Near the Cerro Negra VMS in Area 2 and other places on the Molly Marie Prospect, many calcite veins are found that exhibit red fluorescence under short wave UV light. Some of it is shown below. Some basalt on the property glows like charcoal briquettes at night under UV. 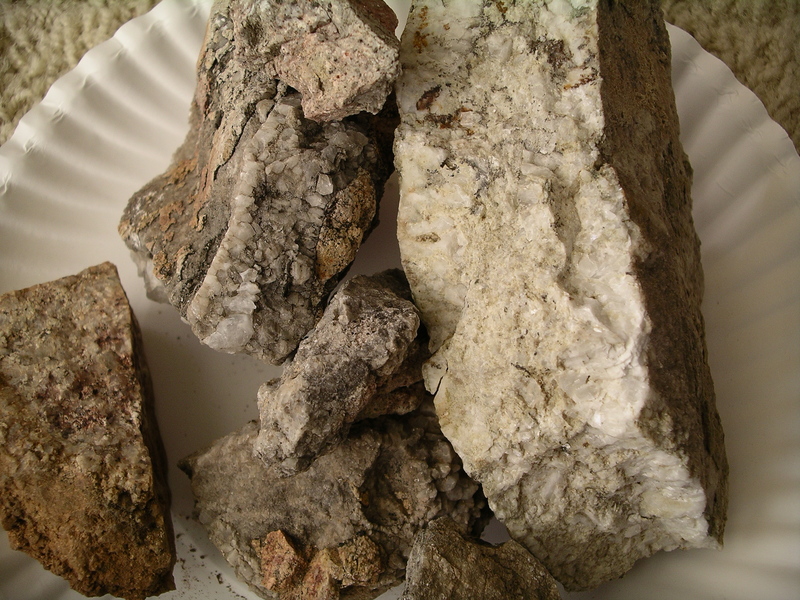 In the famous zinc mines of Franklin, New Jersey, core was “lamped” with UV to look for red calcite. If red was found it was known that a zinc orebody was nearby. It is believed the same phenomena is present at the Molly Marie Prospect. 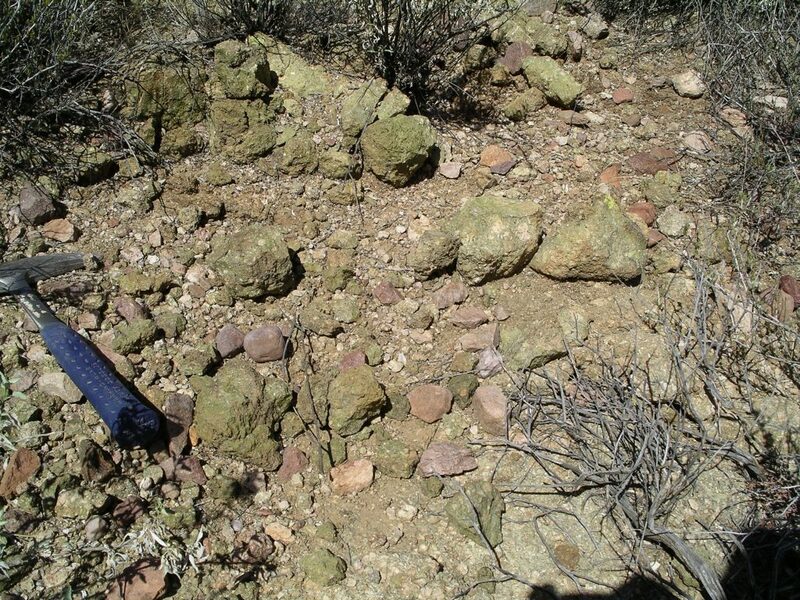 Near the maar diatreme in Area 3, there is a large outcrop of breccia that is comprised of rounded fragments of mafic magma and is exposed for approximately 200 feet in a wash . The matrix is milled arkosic material that is inundated with Aurichalcite. 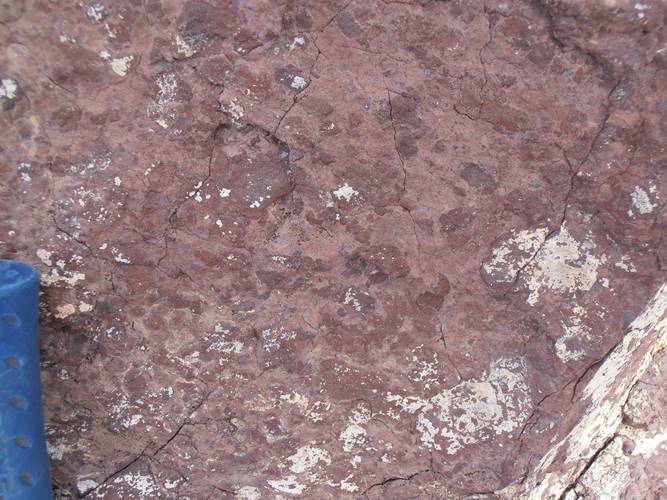 A photo of the breccia is below. One of the rounded fragments is shown below after it is sawn. The dark portion in the center is where dilute HCl was applied. The pencil lead is .7mm. The sawn face of this cobble literally glistens in the sunlight due to calcification. This mafic material appears to have cooled very quickly. Large portions surrounding the VMS in Area 2 have been altered to a red clay by acid alteration. Some of these areas are inundated with quartz veinlets. Some of these areas can be seen with Google Earth. 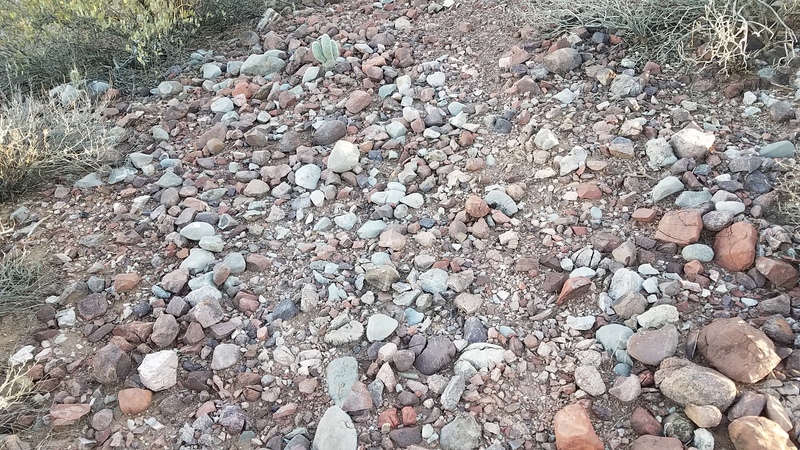 After recent erosion, some quartzite cobbles of the Whitetail formation have been exposed that have been exposed to acid destruction as in the photo below. Arkose breccia in Area 1 that is incised by washes has massive advanced argillic alteration including sulphates, kaolinite, and alunite .